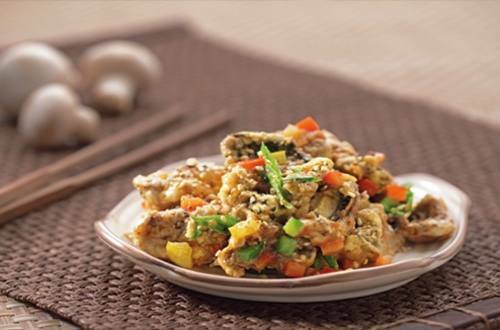 A perfect combo of peppers and mushroom with a twist of Chinese flavors. A perfect dish for an evening meal. ½ tbsp garlic ginger paste. ½ red capsicum finely chopped. 1 green capsicum finely chopped. 2 tbsp chopped spring onion. ½ packet of Knorr Easy To Cook - Chinese Manchurian. 1 tsp roasted sesame seeds. 3 In a big bowl mix all ingredients for mushroom marination and add mushroom. 4 Add 1 tbsp of water & mix well. Ensure that all the mushrooms are coated well with the mix. 5 Grease the marinated mushrooms with 1 tbsp oil. 6 Pre heat the Kenstar Air fryer at 180° C for 3 minutes. Arrange the marinated mushrooms in fry basket and close it properly. Keep the Air fryer at 200° C for 10 minutes. Remove when done. 8 On a low flame heat ½ tbsp of oil. 9 Add the finely chopped capsicum and cook for 1 minute. 10 In a separate bowl, mix ½ packet of Knorr Easy To Cook - Chinese Manchurian with 200 ml water. Add it to the vegetables along with crushed pepper. Stir well and cook for 2 minutes. 11 Once the sauce is thick, add the oxy fryed mushrooms evenly. Cook for 1 minute so that the manchurian sauce coats the mushrooms. Ensure that the sauce dries out and coats the mushrooms. 12 Garnish with green spring onions and serve hot. 13 Enjoy this meal with Knorr Classic Creamy Mushroom Soup.